The first thing I changed is the crawfish. I have an uneasy relationship with exoskeletal seafood – I like it until I think about it – so I downsized to peeled and deveined shrimp. I also left out the breadcrumbs called for in the Look magazine recipe because … well, I think I was out of breadcrumbs at the time. And speaking of bread you will want plenty on hand to soak up the intense garlicky sauce this makes! While dinner cooks let me tell you about a book I recently finished, “Archetype” by MD Waters (and thank you NetGalley and Penguin First Flights for the opportunity to read an advance copy.) Our protagonist Emma wakes in a hospital with no memory. A man named Declan tells her she is his wife, and that she has had a terrible accident. But she dreams another woman’s life, and she hears another woman’s voice – and that voice tells her she may not be getting the whole truth. 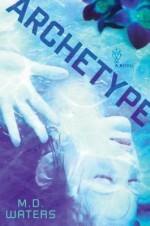 “Archetype” is part one of a two-part series with the second part, “Prototype,” due out in July 2014. In a deep, wide saute pan brown the chicken in olive oil over medium heat. Sprinkle with salt. Add the garlic and saute one to two minutes. Add the brandy. Lay the shrimp on top of the chicken pieces. Cover the pan and cook 15 minutes. Keep an eye on the heat so your brandy doesn’t evaporate completely. Add the thyme and the tomatoes, pushing them under the chicken pieces. Cover the pan and cook an additional 15 minutes. Again, keep an eye on the heat. You want the sauce to thicken but not cook dry. Check the chicken for doneness – cook an additional five to 10 minutes if needed. In a separate pan gently fry the eggs to desired doneness and serve over the chicken. Serve with crusty bread to soak up the sauce. 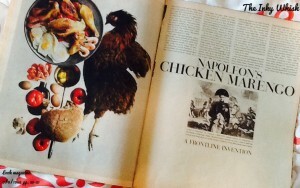 This entry was posted on February 9, 2014, in Book Review, Food and Recipes, Vintage Cookery. Bookmark the permalink.